My artistic style varies depending on the media theme I use on a project. Recently, I have been working on a variety of mosaic projects. 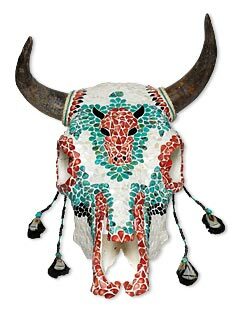 I incorporate my own designs and seek to create 3D images using beads, glass and semi-precious stones on items ranging from animal skulls to table tops. I enjoy creating pieces of art which are original, one-of-a-kind works which are usually pleasing and easily identifiable while still using some abstract ideas. I work in several medias, but my mosaics use materials including a variety of beads, stained and dichroic glass and semi-precious stones. A combination of several ideas which incorporate converting hand drawn images into a 3D realistic, yet slightly abstract project. It also shows how a spirit exists within. The project started as a mental image, then a rough draft sketch, but mostly, once it was initiated, it directed its own creation and modification. I started making fused glass projects about five years ago and one of my high school students actually had an idea to create a small mosaic surrounding a mirror. My work and my students' work has been evolving since that time. I was invited to attend the Las Vegas Bead and Glass Expo and then enrolled in some classes. I have a bachelor and masters degree in fine art and have been teaching art for over twenty years. I visited your booth at the Las Vegas Bead and Glass Expo. Lapidary, drawing, jewelry, reading and studying archaeology. I incorporate jewelry-making in my art classes and also make my own. I participate in art shows and have work in several local art galleries. My website is a work in progress. My students and I do a yearly benefit through donations and silent auctions to raise money for no kill animal shelters. Our project is called Empty Paws. Do what you enjoy first, your passion will show and sales will follow.